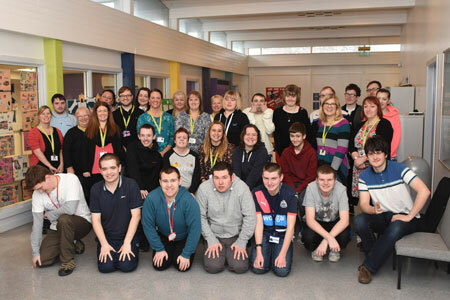 South Tyneside College’s Interface department were finalists at a prestigious national award for its innovative autism provision. They have been recognised by the Autism Professionals Award, which commends and rewards ground-breaking services, organisations and professionals. Interface is contesting the Inspirational Education Provision: Secondary School category – one of 13 overall - which will be judged in March. Its team run post-16 autism delivery which prepares young people for adult life and is unique to mainstream further education in the North East. The department has personalised study programmes for learners using a wide range of NOCN qualifications, to focus on either their social and emotional skills, independence, or employability, and helps them build other essential life skills. Nicola Beldham, curriculum manager of Interface and supported learning, said: “I am incredibly proud that the work we do has been recognised at a national level. “Although we haven’t won, I believe we have every chance of doing so, as our provision is quite outstanding. We are one of just three teams shortlisted in our category. “We have a superb track record for helping individuals understand themselves and their behaviour and to build the necessary foundations to grow in confidence, friendship, independence and academic and vocational success. Student Emma Robson, 26, from Ryhope, Sunderland, said: “I’ve been coming to Interface for two academic terms and it has made a big difference to my life. And James Bunn, 18, from Birtley, Gateshead, added: “The staff are all very nice and very helpful. If you have a problem with your work here, they do everything to support you. Interface opened in September 2007 with just five learners and today boasts capacity for around 45 full-time learners, who attend from across the North East. It has supported many learners into mainstream education, either through Interface programmes, pastoral support from its team, by using its relaxation facilities, or from other support services. Interface’s three autism-specific curriculum pathways are available from entry level 1 to level 2. Provision is tailored to address barriers associated with autism and to help young people develop confidence and equip them to face their adult life with greater skill and self-belief. In the past six years it has developed an outstanding track record in preparing learners to move into mainstream education and to pursue their vocational ambitions.